FCI # 287, Origin: Australia, Group 1.2 Cattle Dogs (except Swiss Cattle Dogs). Grooming: Low, Shedding: Medium, Coat: Medium length, flat, weather resistant double coat. Color: Red or blue speckled (puppies are born white). Ease of training: High, Energy level: High, Span of life: 12-15 years. Breed: The Australian Cattle Dog is frequently called Heeler (from the English word "heeler" for his style of work, however, customary for the other Cattle dogs as well). Herding the cows, the Australian Cattle Dog is nipping them at the lower part of the hind legs. This breed by it's origin and working qualities is close to the Kelpie, although the main task of Kelpies is grazing, and the Heeler - round-up the cattle. The history of Australian Cattle Dog is associated with the development of sparsely populated and less developed state of Australia - New South Wales. Since the middle of the XIX century the English breeders have brought to Australia their herding dogs along with the cattle. The "Black Bobtail" (or Smithfield), which were poorly adapted to the heat, were too big in size and too heavy built. These dogs were also too noisy and very often they were scaring animals. Farmers decided to breed a more suitable sheep dog for Australia. First there was an unsuccessful attempt to cross Smithfield with Dingo in 1830 - the red short-tailed dogs, though worked in silence, were biting the cattle too hard. The dogs, bred by crossing the Rough Collie with the Bull Terrier were also rejected. In 1840, the landowner Thomas Hall ordered from Scotland several smooth haired Collies of black and blue and gray and black marble color and began to interbreed them with Dingoes, another landowner - James Elliot of Queensland - did the same. The obtained dogs - "Heelers", had a very good working qualities. 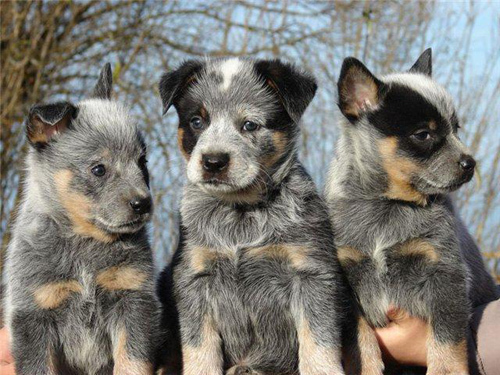 Until now, many people call them the Blue Heelers, or the Queensland Heelers. Somewhat later, Bagust brothers - farmers from the vicinity of Sydney - added to the Australian Cattle Dog a blood of Dalmatian, from which the breed has inherited the "picture" of a coat - mottled-roan. To improve the working abilities of the new dogs, there were used Kelpies. Robert Kaleski, a young assistant of the breeder Harry Bagust, was a tireless advocate and promoter of the Australian Cattle Dogs and other breeds of Australian working dogs. Without him these breeds would not have such recognition. He was publishing his ideas on the pages of weekly newspapers (mostly, "Sidney Mail"), explaining the importance of the role played by the Australian Cattle Dog and Kelpie in the livestock industries of Australia and calling for the universal recognition of the need for the development of these breeds. 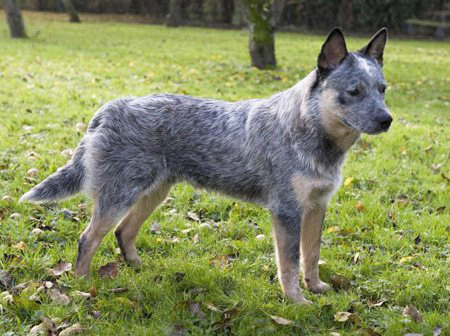 Kaleski developed the first breed standard for the Australian Cattle Dog in 1897. It was published with the photographs made by the Department of Agriculture of the New South Wales in 1903 and reissued in 1910. Nipper - the Australian Cattle Dog, bred by Harry Bagust - was a classic example of the breed, which was described by Kaleski and he was probably most similar to the constitution of the Hall's Heelers. He also looked like a rustic shepherd dogs, filmed in 1940, that allegedly had their direct ancestors among the real Hall's Heelers. Standard written by Kaleski was adopted by the breed clubs in Queensland and New South Wales and reissued as their own, but with the small local changes. This standard has become the first big step to the formation of the breed. In 1980, the Australian Cattle Dog was officially recognized by the American Kennel Club. In the modern form the standard for the Australian Cattle Dog was written in 1963 and the last version was issued by FCI in 1987. General Features: The Australian Cattle Dog has a massive head with a broad, slightly convex skull. The stop is poorly defined. Straight nasal bridge is strong, has an average length. Lips are dry and tight. Dark - brown eyes, of an oval shape and medium size. Small, strong ears - wide at the base, erect and pointed. Slightly long body of the Australian Cattle dog is compact and proportioned. The neck is strong, without dewlap. The chest is deep and wide. Shoulders - sloping, strong and muscular. Ribs - convex. Back - strong. Wide waist - muscular and strong. Strong legs with round paws. Fingers are strong, short, arched and compact. Nice and fluffy tail at rest is down, may be a just little curved at the end. The coat of the Australian Cattle Dog is straight, short, waterproof and tight. On the abdomen and hind legs longer than on the body. The undercoat is dense and short. Color - red marbled with smooth red speckled spots throughout the body, or blue with dark or speckled patches of darker color, with the addition of black, yellow or blue marks on the head. Temperament: The Australian Cattle Dog (Australian Heeler) is a compact, sturdy working dog, extremely agile and powerful.This is a perfect dog for herding the cattle, which, despite it's small height, is easily managing the herd. The Australian Heeler is a stocky dog, but very strong and courageous. He has a remarkable mind. This is a great guard, suspicious of strangers, but loyal and kind to the owner. He is confident, learns fast, but needs a good leader. By purchasing this dog as a pet for home, try to avoid the working breeding lines, since these dogs can be overly active and energetic. The Australian Cattle Dog needs consistent training and daily attention. As the Australian Cattle Dog is working and sporting dog, he feels good, if most of the time he can spend outdoors. He is getting along pretty well with the other dogs and animals, but the strangers are not allowed in the places, that the Australian Heeler considers as his (or his owner's) property. Vigorous Australian Cattle Dog is a tireless worker and a very reliable partner, usually he keeps working till the very old age. One dog of this breed even became famous, because had lived for 29 years. In Australia, this breed is very popular, every year an average of 2,500 puppies are registered by the local Kennel Clubs. The Australian Cattle Dogs are especially common on the farms in New South Wales and Victoria. Health problems: In general Shiba Inu is a very healthy breed. In some lines hip dysplasia and some alergies may be an issue. Height: 17-19 in, Weight: 30-35 poundsGrooming: Low, Shedding: Medium, Coat: Medium length, flat, weather resistant double coat.Color: Red or blue speckled (puppies are born white).Ease of training: High, Energy level: High, Span of life: 12-15 years.